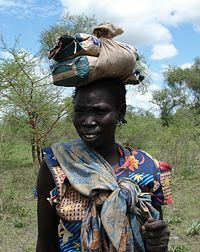 Nuer woman, second wife of chief Alesio. The Nuer are a people located primarily in southern Sudan along the banks of the Nile River, as well as parts of western Ethiopia. They form one of the largest ethnic groups in southern Sudan. Their history is connected to that of the Dinka, their neighbors, with whom the Nuer have inter-married when they took over parts of the Dinka lands. They are primarily a pastoral people; cattle herding is a pivotal part of Nuer culture, and most aspects of daily life involve cattle in some form. The vast majority practice their traditional animistic religion; attempts by missionaries to convert them to Christianity have met with limited success. The Nuer today face the challenges common to all traditional cultures in how to relate to the broader human society with its modern technology and lifestyles, and yet to maintain their unique culture and identity. The civil war in the Sudan has exacerbated the challenge, with those that fled finding themselves refugees in foreign cultures, including the United States, while those that remain live traditional lives but without adequate resources, many even losing their cattle. Under these conditions, the age-old hostilities between Nuer and Dinka re-emerged, making their path to a society of peaceful co-existence and co-prosperity challenging. Archaeological excavations along the Nile River suggest that an economic system almost identical to that of the Nuer existed as early as 3372 B.C.E. Oral tradition suggest that the Nuer expanded to occupy some of their current territories around 1600 C.E. The history of the Nuer is closely tied into that of the Dinka, who inhabited territory that came under Nuer control during the 1800s. From circa 1820 to 1860, the Nuer expanded, mostly into regions inhabited by Dinka. Floods may have displaced the Nuer, causing them to attempt to gain new lands, or war may have been declared for the gain of cattle or women. The Nuer were superior warriors, and often carried a bow, a club, and a large lance or spear. Nuer military strategy involved surprise attacks and ambushes, and the Dinka were no match for Nuer tactics and fighting ability. The inclusion of the Dinka people into Nuer culture was made easier by the fact that the two groups appear to share common ancestry, as well as the fact that their cultures and languages are similar in nature. Also in the late 1800s, the Nuer had a number of conflicts with the neighboring Anuak, whom they also raided and from whom they attempted to seize lands. At one point, the Nuer had nearly wiped out the Anuak culture, but when the Anuak obtained guns from Ethiopia, they were able to fight back successfully and the Nuer ceased their expansion into Anuak lands. The intrusion of foreigners, including British colonialism affected a great many peoples of southern Sudan, including the Nuer. Before the late nineteenth century, Arabs from northern Sudan would raid the south for slaves, as they viewed the southerners as inferior pagans. When the British arrived in Sudan, they made a concerted attempt to control the interactions of the Sudanese people. The British attempted to stop the raids that the Nuer conducted upon neighboring peoples, which, in the case of the Dinka, led to more organized battles. The Nuer are organized as a number of autonomous communities; great importance is placed on patrilineal lineage. Groups of lineages are organized into clans, who have a slightly privileged status within their specific territory. The less privileged might include members of other clans or those of Dinka descent. Within a community, men are divided into six age sets. The Nuer speak an Eastern Sudanic language of the Nilo-Saharan language family. The Nuer language is similar to that of the neighboring Dinka and Atwot. The Nuer refer to themselves not as Nuer, but as Naath, meaning "human beings." The importance of cattle to Nuer life can be seen in the fact that men and women both take the names of their favorite oxen or cows, and often prefer to be greeted by their cattle names. 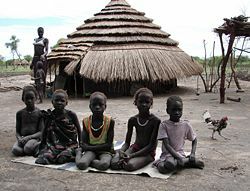 The religion of the Nuer is predominantly one of monotheistic animism. Efforts by Christian missionaries have converted a very small segment of the Nuer people to Christianity, but most practice the traditional religion. The Nuer religion is animistic in many respects, but they also worship a creator named "Kowth." All life is believed to both come from and return to Kowth. The Nuer pray and offer sacrifices of cattle to Kowth, hoping for health and well-being, to ward off danger or evil, and as part of ceremonies such as marriage. There is no organized hierarchy of religious practitioners, although individuals may become diviners or healers. Like other Nilotic religious traditions, long-dead ancestors are respected and venerated, but the more recently deceased are thought to be able to cause trouble. Dances, at which the Nuer often play the drums, are an important part of Nuer social life. The dances are one of the main arenas for courtship rituals between Nuer youth, and generally incorporate a combination of drumming and stringed instruments. 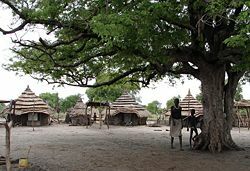 Nuer Village central tree where all the meetings are held. Nuer life is centered around the herding of cattle. Cattle have historically been of the highest symbolic, religious, and economic value among the Nuer, and play an important role in most areas of Nuer life. Cattle are particularly important in their role as bridewealth, where they are given by a husband's lineage to his wife's lineage, as well as their role in sacrifice. While the Nuer do eat beef at celebrations after sacrifices, most of their food consumed consists of fish, grains, and vegetables, all of which are grown or caught for sustenance and not to be sold. The Nuer generally live in temporary circular mud homes with thatched roofs. When the rivers rise in the wet season, the Nuer live in settlements on higher ground. During the dry season, the men often sleep with the cattle in grass shelters in the lower areas towards the river. Nuer women returning home from Lekwongole market. Marriage is an important part of Nuer culture. Marriage is polygamous in Nuer culture, and men will often have several wives in various villages. Once a woman is married, she is expected to remain loyal to her husband, and encounters with other men are treated as adultery. Marriage is a series of complicated ceremonies, one of the first of which involves the presentation of the bridewealth (cattle) to the bride's family. Marriage is not considered complete until the first child has been born, at which point the marriage has produced a child that connects the husband and wife's lineage. After the birth of a second child, the marriage is considered stable, and none of the bridewealth would need to be returned if the couple divorced. It is important for Nuer men to father at least one male heir, and if a man dies before he is able to do so, his relatives can marry a wife to his name and have children by her. This custom is known as "ghost marriage." The Nuer receive facial markings (called gaar) as part of the rite of passage initiating them into adulthood. The pattern of Nuer scarification varies within specific subgroups. One common initiation pattern consists of six parallel horizontal lines across the forehead, with dip in the lines above the nose. Dotted patterns are also common (especially among the Bul Nuer). 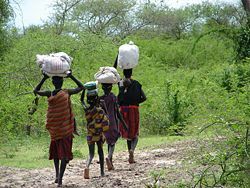 Because of the civil wars in southern Sudan, many Nuer have emigrated. Approximately 25,000 Nuer refugees have been resettled in the United States since the early 1990s, with many Nuer now residing in Nebraska, Iowa, South Dakota, Tennessee, Georgia, and many other states. Nuer in southern Sudan still live a somewhat traditional life. Cattle remain an integral part of Nuer culture, as do the rituals surrounding marriage and courtship. 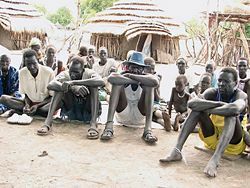 The strife in Sudan and modern technology has had negative effects on the lives of the Nuer, however. Cattle raids were performed with traditional spears up until 1983, fatalities of raids were minimal, and women and children were considered off-limits. As Sudan's war continued to influence the region, guns began to replace spears, and rebel commanders argued that a gun death carried no individual responsibility in a "government war." Therefore, there was no reason to believe the traditional belief that the spirit of the slain would haunt the slayer. Killing soon became easier, and violence became more widespread. Peace conferences between the Nuer and their rivals help to solve the problem of escalating violence. ↑ 1.0 1.1 "Nuer Religion" Retrieved February 15, 2008. ↑ 2.0 2.1 Keith F. Otterbein, "More on the Nuer Expansion" December 1995. Current Anthropology Vol 36, Num 5. The University of Chicago Press. Retrieved February 15, 2008. ↑ Robert O. Collins, "History of the Anuak to 1956" Anuak Justice Council. Retrieved February 15, 2008. ↑ "Sudan Regionalism and Ethnicity" 1991. The Library of Congress Country Studies; CIA World Factbook. Retrieved February 15, 2008. ↑ "Nuer" 2007. Encyclopædia Britannica Online. Retrieved February 15, 2008. ↑ 6.0 6.1 Orville Boyd Jenkins, "The Nuer of Sudan and Ethiopia" March 1997. Retrieved February 15, 2008. ↑ "Nuer Religion" Retrieved February 15, 2008. ↑ E.E. Evans-Pritchard, "Kinship and Marriage among the Nuer" Retrieved February 15, 2008. ↑ Karl Vick, "Sudanese Tribes Confront Modern War" July 7, 1999. Washington Post. Retrieved February 15, 2008. Evans-Pritchard, E. E. Kinship and Marriage Among the Nuer. Oxford University Press, 1990. This page was last modified on 14 December 2018, at 15:48.